https://southdenver.bintheredumpthatusa.com/dumpster-rental-castle-rock	Bin There Dump That South Denver	https://southdenver.bintheredumpthatusa.com/img/franchisees/1.jpg	202-10004 Dransfeldt Rd, Parker, CO	Contact us for more details. 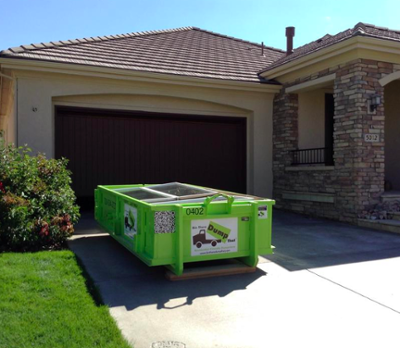 Discover how we make renting a dumpster in Castle Rock, CO a simple and easy process. Bin There Dump That is committed to making the dumpster rental process for the customer a seamless transaction, from placing an order for the needed dumpster size to delivery of the waste container in Castle Rock to an immediate pick up when you no longer need the bin on your driveway. Castle Rock gets its name from a unique rock that is shaped like a medieval castle tower. Founded in 1874, it's now home to more than 66,000 inhabitants. Visitors love Castle Rock for its scenic mountain setting and so do its residents. What makes Castle Rock unique is an extensive park system and open spaces to explore. There are more than 50 miles of trails to explore. It's a hikers paradise and there are some great bike trails as well. The great outdoors takes up more than 25% of the communities total land area. For a more unique outdoor adventure there's the Miller Activity Complex. Visitors can try their hand at zip lining, a rope course or even a trampoline. There's also a pool, batting cages, a golf simulator and an indoor lounge area for relaxing after a busy day of activities. Outlets at Castle Rock provides a great shopping experience. This place has great stores and great food. You'll find stores such as Nike, Calvin Klein and Under Armour. For a more traditional shopping experience there's some great stores in downtown Castle Rock. Here you'll find the Book Nook, Miss M's Terra Parlor and Castle Rock Music to name a few. In true Colorado tradition the town has its share of microbreweries. You can't leave Castle Rock without trying a brew from 105 West Brewing Company or Burly Brewing Company. Both breweries offer tours and taste testing. Castle Rock is one of Colorado's finest towns and it's the kind of place you never want to leave. Your local Dumpster Rental Castle Rock dumpster rental operator is Bob Cotner And Joe Chupp.